This is my current finished painting, something different for me, no horses, no animals in site. I am finding that once I scan my painting it is so much easier for me to see it clearly. Next painting is a close up rabbit painting. I can't stay away from the animals to long! People are challenging for me, when I was in practice I always struggled with the owners names, but the dogs and cats I could remember. I was often standing in the grocery line, seeing a client and thinking, "there's Cocoa's mom," not able to recall the owners name, but picturing and remembering the dog quite easily. 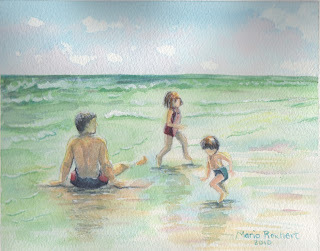 Well, I enjoyed painting the ocean, using the bright colors, can't help but remember when the kids were young how wonderful a moment like this was. No television, no texting, no ipod, no driving to a soccer game, just contentment, happiness. If only every day could bring moments like this, being in the moment, pure joy. This is beautiful! It has such a nice feel to it...the simple life. 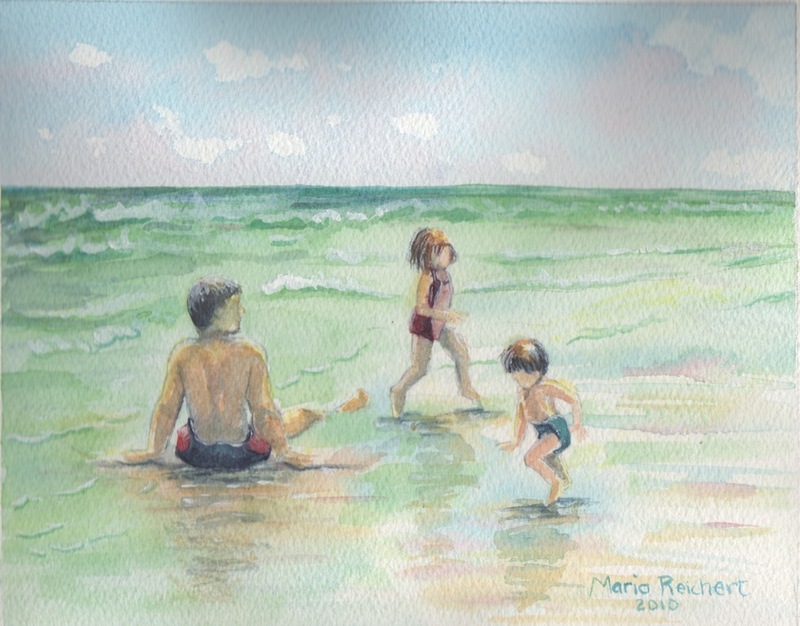 Thanks Theresa, I would like to try some more ocean painting, it is very peaceful.